The world and China’s place in it have been transformed over the past year. The pressures for change have come from the most severe global financial crisis ever, and from what so far is the largest decline in output over a comparably short period in the history of the word economy. China and its economic prospects have also changed, but not so much as China’s place in a changing world. 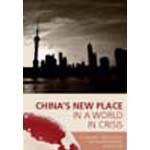 The global financial crisis has accelerated China’s emergence as a great power, in advance of China or its global partners thinking and working through the consequences for managing the implications for the governance of world affairs. The China Update 2009 brings an international group of authorities together to examine how China's increasing significance effects macroeconomic adjustments amid the current global recession, economic and financial integration, and issues of the environment and climate change.